Most companies don’t develop and implement unclaimed property rules, policies, and procedures until they’re subject to an audit and are forced to develop them. When it comes to unclaimed property however, it pays to be prepared – with the best defense against an audit simply being a good offense. Keane’s National Consulting & Advisory team will help you develop business-specific policies and procedures to keep your organization in compliance with unclaimed property regulations – with the least operational burden. We will help educate your team on strategies to minimize the generation of unclaimed items, identify new property types as your company grows, and implement self-audits to ensure compliance. At Keane, we believe that every company should have formal unclaimed property policies and procedures for handling all potential types of abandoned property – from disbursement of checks through filing of reports.  Copies of written unclaimed property rules, policies and procedures. Auditors then use this information to determine whether or not a business and its designated service providers operate under a “culture of compliance.” Most companies don’t have both and as a result find themselves in trouble with auditors. In the unclaimed property industry, due diligence is the practice of mitigating unclaimed property liability at its source – by finding missing owners and helping them to take action to reconcile their accounts. Rather than waiting until statutory due diligence is required (i.e. after a dormancy period has run its course), we help you set up the proper processes to reach out to customers six to nine months after a check goes stale or a credit remains unused – giving you better odds of finding missing individuals. We’ll also provide you with strategies for addressing your undeliverable mail population on an ongoing basis. In our experience, we have found that the organizations who are proactive with customers, employees and vendors, have a better time managing the financial balances that are on their accounting books and records, making them more compliant with state escheatment laws and regulations. Our Consulting and Advisory team will help your business develop a robust escheatment process to ensure reports are filed in accordance with all state escheat reporting laws and that you only escheat funds to the state when appropriate. Keane can also supplement your existing escheatment procedures through our annual compliance reporting service. Our proven processes alleviate the strain on internal resources while ensuring your unclaimed property responsibilities are met. In the world of unclaimed property rules and regulations, upholding company-wide policies and procedures is just as important as achieving compliance with state escheatment regulations for the first time. Proactive due diligence with customers, employees, and vendors is a proven best practice in maintaining effective and long term compliance. If you still have questions about Unclaimed Property & Escheatment Policies & Procedures, please contact us for additional information.